Vlatka Horvat explores and breaks the boundaries of the gallery, architectural objects, and the body in her first U.S. solo show at The Kitchen. Vlatka Horvat "Or Some Other Time"
Vlatka Horvat’s exhibition, “Or Some Other Time,” ranges freely up and down the walls and throughout the rooms at the back of The Kitchen’s second-floor gallery. In earlier works, the Croatian-born, New York–based artist has explored the ability to cloak, conceal, and collage the human body in an environment, and in her first U.S. solo show she continues that practice with objects in an exhibition space. Horvat begins by blurring and breaking the spatial boundaries of the gallery itself. Floor Chair (2009), an old classroom chair that has been sawed in half, is displayed sliced-side down so that the absent other half appears to have sunk through the gray-painted boards. The white wall that divides the space into two rooms is in fact part of Wall Fan (2009). Horvat has embedded a ceiling fan and a timer into that “custom-built wall,” but only the three stainless steel blades that swipe in and out of the gallery’s rooms are visible as they pass through a thigh-level horizontal slit in the plaster. Bolted to the back wall, Ladder (2009) hangs in the corner of the first room. In fact only half a ladder (the other half hangs on the wall’s other side), its rungs ascend from about six feet up from the floor all the way to the top of the wall, drawing visitors to ponder the dark, gridwork of the ceiling above. Many of the works in the second room incorporate furniture, a favorite subject of Horvat’s. Two of them use the same halved wood-and-metal chair. 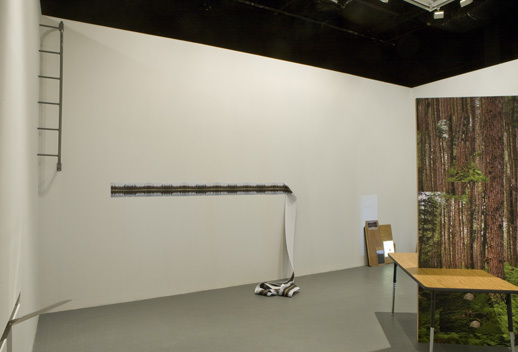 For Table Forest (2009), in the center of the gallery, Horvat has pierced a familiar classroom table – one with adjustable metal legs, a wood-grained plastic surface, and a band of brown rubber wrapped around its rounded edges – with a tall piece of masonite sporting a composite photograph of a lush forest. Pieces of this faux-wood tabletop reappear in two other works at the gallery. 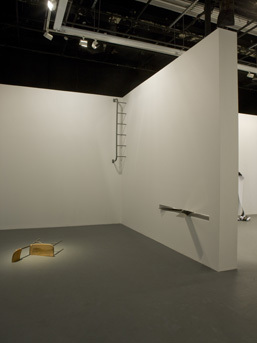 The material supports a makeshift cardboard screen in Walk Pivot (2009), a mixed-media work of inexplicable complexity in which Horvat sends images of disembodied pivoting legs from two projectors onto four different screens. (Mirrors and plexiglass are involved.) That unmistakable plasticized material reappears in Birds Shelf (2009), where it serves as the man-made “branch” upon which a group of plastic birds sit. Walk by and the photosensitive figurines turn their heads back and forth, open and close their beaks, and tweet. Horvat explores and breaks the boundaries of the gallery in the first room, and plays with the idea of what constitutes an appropriate furnishing of space in the second. But ultimately, this exhibit of modified objects falls flat without an active viewer animating it. How active? It might help to imagine how Horvat might have injected her own body into the exhibit. Would she have hidden behind Floor Chair, or under Table Forest? She did something similar with a backpack, a door, a fire extinguisher, and other unlikely objects in her 2003 series, Hiding. For her 2004 Searching (1-11) series, Horvat made photographs of herself with her head stuck under a car, over a fence, into a bucket and a washing machine; perhaps here she might have dared lie beneath (but safely out of reach of!) the blades of Wall Fan. Or hang from the bottom rung of Ladder, as she did from a soccer goal in One-on-One: Goal (2006). Much of the work in “Or Some Other Time” will not engage the viewer who does not engage with it (or does not at least imagine such an engagement). But even the most standoffish visitor, one who prefers to look at art as opposed to interact with it, should take a close look at Horizon (2009). A long inkjet printout on a roll of white paper depicts a pastoral scene, a prototypical combination of sky, trees, and grass reflected in a body of water. The scene repeats endlessly, seamlessly, like tacky 1950s wallpaper in miniature. For a few feet, the paper is pasted to the wall at eye-level, but it then descends into a pile at your feet. The trees, rising up into the sky and plunging down into the lake, could be the results of an environmental EKG. The folds of paper on the floor sit discarded, like yesterday’s financial ticker tape. It is one of the show’s simplest works, and also its most satisfying.